The Danner Men's 11700 Black Super Rain Forest Insulated Waterproof USA-Made Boots is the king of outdoor footwear. It's designed to withstand the toughest and roughest conditions to let you work with confidence day in and day out. This black footwear features f ... (see full details) (see specifications) #DNN11700. The Danner Men's 11700 Black Super Rain Forest Insulated Waterproof USA-Made Boots is the king of outdoor footwear. It's designed to withstand the toughest and roughest conditions to let you work with confidence day in and day out. This black footwear features full-grain, waterproof leather uppers for long-lasting and rugged durability. They have double-thick leather vamps and hyper-strong, triple-stitched nylon thread that add even more strength to this hard-wearing design. Reliable stitchdown construction attaches the Vibram 132 Montagna outsoles. 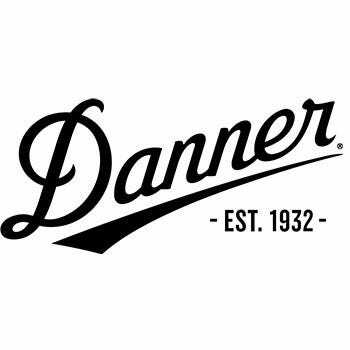 This special type of stitchdown construction allows you to get this footwear redrafted at Danner's Portland factory, if needed. The right-angle heels and wide lugs on these premium shoes provide a stable base and slip- and oil-resistant traction on a variety of surfaces. For even more reinforcement. In addition there are nylon shanks built in to support your arches. To be the "king" you have to be more than just rugged; comfort is equally as important. These insulated boots combine a waterproof Gore-Tex booties along with 200-gram Thinsulate insulation and a soft lining to give you the ultimate in breathable, waterproof wear. It's designed to work sort of like your skin, moisture can escape, but water never gets into the men's shoes. With this collaboration you'll have dry, comfortable feet that stay warm no matter where your job takes you when you wear this Rain Forest footwear. You'll certainly feel like royalty while wearing the king of outdoor men's footwear. Pick up your Danner Men's 11700 USA-Made Super Rain Forest Waterproof Insulated Black Boots today and reign supreme over all your workplace challenges. Please note: This is a custom, made-to-order boot that takes approximately 4-6 weeks for delivery. Danner Boots: Men's Black 11700 Waterproof USA-Made Insulated Rain Forest Work Boots is being added to your cart.